Welcome to Guide Dog Oakley! We are continuing to raise money for Guide Dogs. We did a sponsored walk along the Kennet & Avon in July and October 2015 (delayed following the death of my "human Dad's" Dad). To date we have raised in excess of £15,000. We have named a puppy "Raymond" after Dad's Dad, completed our second target to name a puppy "Chrissie" after Mum's Mum, who died in August 2016. We have just completed our third fund to name a puppy "Margaret" after Dad's Mum, who died on 7 October 2016. Please do consider giving even just a small amount to help this very worthwhile charity. We have now just started our fourth fund! Please click on the link below to donate. I'm famous! Read all about my walk with Mum in the Newbury Observer. 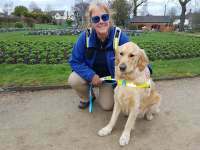 My name is Guide Dog Oakley, and I work with my human "Mum" Tracey Clarke. Along with my human "Dad" Tim Clarke, we live aboard the narrowboat NB Sola Gratia. 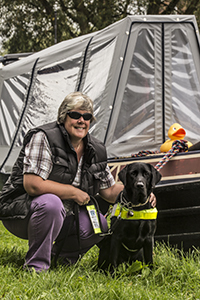 Mum says I am the only Guide Dog who lives nomadically on the Inland Waterways of Britain. I have no idea what that means. I just enjoy the fact that I have a different garden to play in almost every day! When we are cruising, I sometimes take Mum along the towpath while Dad comes along behind with the boat. This is much more fun for me - I do so enjoy walking. It gets a bit rough and uneven sometimes, so I have to really step up to the mark and carefully steer Mum so she doesn't come to any harm. She only has 2 per cent vision, so she can see a little bit, but I am her eyes most of the time. There are things called "locks", where Mum has taught me to "find the beam", or "find the bollard". I expertly guide her as instructed, then she winds things up and down, and opens and shuts big gates so that Dad can bring our home through. Sometimes, Mum needs to cross the lock. She doesn't do it very often, though. When she does, she tells me to "walk the plank"! (This is a footboard that is attached to a lock gate. Mum will only go across this if it is wide enough to be safe for us both).